This measures 6&1/2 inches long to the eylets and 11 & 1/2 inches wide without stretching before it is stitched together. Always working in the back loop of each stitch for ribbed effect. You also will be working in the same stitch as your turning chain through out. You just "ignore" the chain when you come to it, working only in the actual half double crochet. Row 1: Half double crochet in second chain from hook and next 29 chains, single crochet in next chain, half double crohcet in last 4 chains. (34 half double crochet and 1 single crochet stitches). Row 2: Half double crochet in same stitch as turning chain, half double in next 3 stitches, chain 1 and skip the single crochet, half double crochet in next 30 stitches. ( 34 half double crochet and 1 chain) . Repeat rows 2 and 3 for a total of 34 rows, except on last row do a slip stitch in the single crochet. Sew up seam. Make a chain of 50-55 stitches or cut a length of ribbon to thread through eyelet holes. Tie in a bow. This opening can allow for wires if needed while baby is in the hospital. Redheart Baby Soft Yarn or Bernat Softee Baby Yarn. Measures about 3 & 1/2 inches square before it is crocheted together. Working in back loop through out. Row 1: Half double crochet in second chain from hook and each chain remaining. ( 20 half double crochet stitches) Chain 2 and turn. Row 2: Half double crochet in same stitch as turning chain 2 and in each half double crochet remaining. (20 half double crochet) Chain 2 and turn. Just ignore the chain 2 when you come to it, same as the hat. Repeat row 2 until you have a total of 20 rows. Fold the bootie in half , turn, and single crochet the toe together across the top, for a total of seven single crochet. Now working in the one side of the bootie, half double crochet in the next 13 stitches continue around the other side of the bootie half double crochet in next 13 stitches on the other side. The back of the bootie will be open. Join by slip stitching around the beginning chain 2. Round Three of top: Repeat round two. End off. Sew up the heel seam. 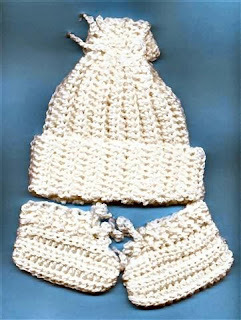 Either crochet a length of yarn to fit around bootie or use a ribbon. Thread this through the first round of the bootie top and tie.